Numidian archers were battle winners for the Romans as well, giving extremely good accounts of themselves under Caesar and against the Celts and Germans who resisted the onslaught of Rome. Ever since the dawn of our people, we have fought from a distance. With sling and javelin we conquered the sands, only the cowardly settled people behind their walls resisting our might. When the Phoenicians came, they conspired with our settled cousins and drove us into our desert homeland. To our shame, the newcomers had a weapon that could outperform our traditional arms. But we adapted, we adopted, and we gained prominence again. With their composite bows in our hands, we became the most feared and sought after archers in the Western Mediterranean. We wear none of the cowards' armor, for it slows us in battle. Our stout Canaanite bows deliver death from afar, sending heavy arrows tearing through the ranks of the armored enemy. With a hat-helm protecting us from the harshness of the sun, we can deliver volley after volley of indirect fire. When the enemy is routed, we descend upon him like ravenous hyenas, and bash their heads in with our cudgels. If attacked up close, we can give a good enough account of ourselves, as our weapons will tackle all but the most heavily armored infantry, but we believe this is a waste of good archers. Use us wisely, general, and remember that we can win battles for you if employed properly. Historically, the Numidian peoples lacked all but the simple bow until the arrival of Phoenicians at the end of the Bronze Age. 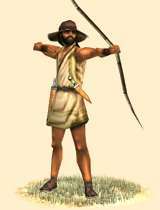 Though it took some time, Numidians began to take up the bow with tremendous vigor. Soon, Carthage itself was replacing Phoenician archers with Numidian, and sending the former to become Marines in her great navy. Numidian archers were battle winners for the Romans as well, giving extremely good accounts of themselves under Caesar and against the Celts and Germans who resisted the onslaught of Rome.